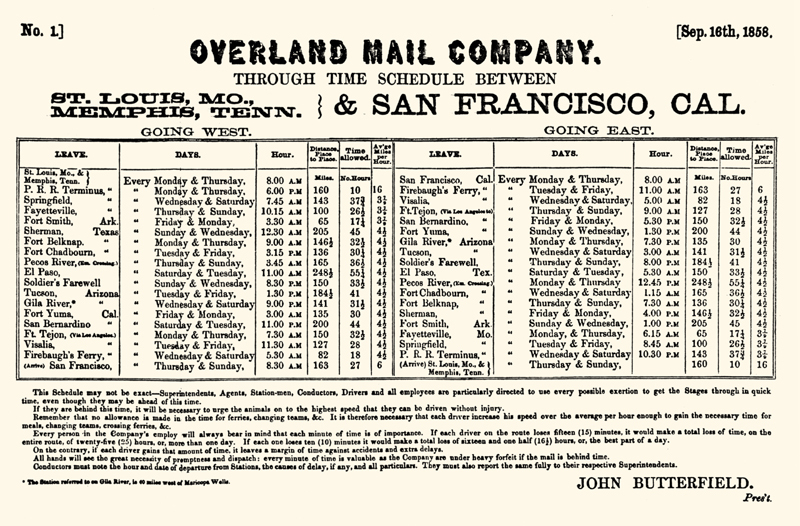 Overland Mail Co. timetable, Southern Route (San Francisco to St. Louis, Mo.) showing Fort Tejon as a timetable station where mail and passengers were exchanged between wagons. The distance from San Bernardino to the Fort Tejon station was 150 miles; the route ran through Los Angeles and up through the Santa Clarita Valley. From there, the next leg of the route to Visalia was 127 miles, in each case stopping briefly at several stations along the way. John Butterfield's first stagecoach started out from San Francisco along the Southern Route to St. Louis, Mo., at 10 minutes past midnight on Sept. 14, 1858. On board was postal inspector Goddard Bailey. His report to Postmaster General Aaron Brown listed a total of 139 stage stations. This gives an average of 19.4 miles between stations. There were 180 by the end of Butterfield's service, which gives an average distance of 15 miles between stations. Dated two days after that intial departure, Butterfield's schedule (shown) set the goal for the arrival time at each "timetable" station. The average distance between them was about 160 miles. At a timetable station, the driver on the eastbound stage would meet the driver of the westbound stage and exchange mail and passengers and turn back. This way, each driver and conductor became intimately familiar with his section of trail. The stages traveled 24 hours a day without stopping, so no one person could drive the entire 2,700-mile, 25-day route himself. He would have to stay awake the whole time. Nor did any single stage complete the entire journey. One hundred stage wagons were distributed to the various stations. John Butterfield was a strict disciplinarian. No more than 20 minutes were allowed per stop. In the fine print at the bottom of the timetable, Butterfield outlines his requirements for meeting the schedule. He notes how much total time would be lost if each driver took just 10 minutes more time than he should at each station: 16.5 hours. Under Butterfield's contract, if the mail between the eastern and western terminus was not delivered within 25 days, his Overland Mail Co. had to pay a fine.